French Spice 2012 is now part of Miami Spice Event Calendar, check this out! Experience a taste of France among the diversity of Miami in November 2012! French Spice offers a fine dining experience with 2, 3 and 5-course lunches and dinners at very attractive prices. French gastronomy enthusiasts will enjoy authentic French wines starting at $20 per bottle and $6 per glass. Lunch: 2-course lunch for $15, 3-course lunch for $25 and Dinner: 3-course dinner for $35, 5-course dinner for $50. 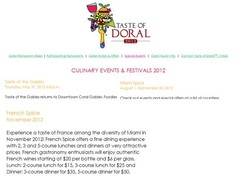 French Spice 2012 is on Taste of Doral Website! French Spice 2012 is on Miami Herald Website! This year, for its 3rd edition, South Florida's top French Restaurants will have the opportunity to offer, at lunch and dinner, two prix-fixe menus along with a pre-defined French wine list.